You may have gathered that I'm a bit of a deal-shopper. It's in my blood. My sisters are the same way, Mom's the same way, you get the idea. We're much happier knee-deep in a TJ Maxx clearance aisle than in a beautiful, swanky boutique. I love shopping consignment sales and Facebook sales for kids' clothes and gear. I mean ... they wear these clothes for maybe half a year max, their spit-up yellows the collars, they drip marinara sauce down their shirt fronts, their legging knees are covered in dirt, and do we even need to talk about potty accidents? I didn't think so. In the past three days I have picked up some really adorable items and wanted to share! Yesterday Camille and I went to Kid to Kid (a consignment store) to look for 2T pajamas for her and maybe some size newborn gender-neutral gowns. We purchased neither of those items on our list. But we did get some super cute dresses! This is just a cute little Carter's number, but I love the bold print for Camille. It was $5.99! This Hanna Andersson knit number was a little more at $9.99, but the quality of this line is GREAT and it also holds its resale value pretty well if I decide to sell it. 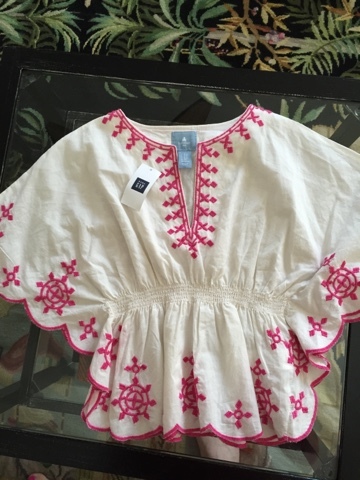 Stopppp right now and someone please say that Gap has this embroidered tunic in my size as well for maybe the most adorable Mommy & Me beach photos. I really wish that was an option! This top still has original tags attached and was just $5.99. I love it when I can find outfits with coordinating tops and bottoms. 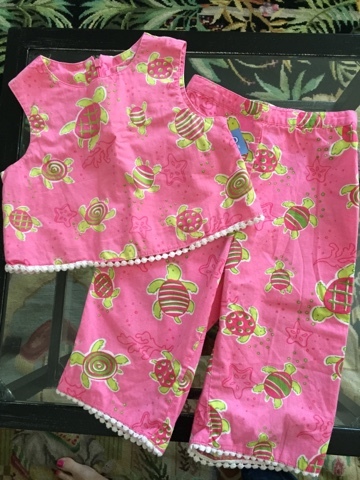 This little pink and green turtle outfit was just $7.99 and it makes dressing Camille SO easy! I can just see her in it now this summer with some little white sandals. And a purse. Oh my lands. Okay, so this one may be the best deal of all ... your input yesterday on baby tubs was so on-point and interesting! And imagine how happy I was when this bad boy popped up on a Facebook selling group I'm in here in Charlotte for just $5! I immediately pounced on it and scooped it up yesterday afternoon. I'm so glad that I found it for this amazing price after seeing so many of you talk about how wonderful the Angelcare lounger is. 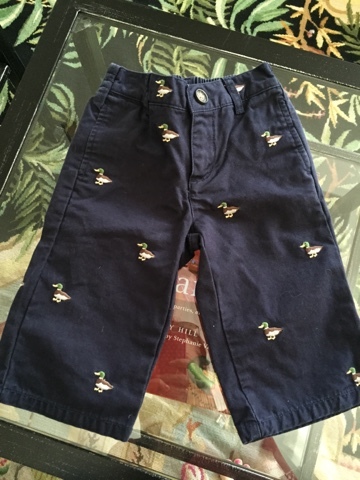 These little size 3mo pants have embroidered ducks on them and are by Janie and Jack. I got these on a Facebook selling page for $3! And this sweet one-piece knit number was $5 and was originally purchased from a boutique in NY. It's larger, size 6-12 months, but I just couldn't resist it. So there are my finds so far this week! I probably need to put myself on a bit of a shopping hiatus ... that is, until the next awesome deal comes across my Facebook feed. Oh my goodness!! So much cuteness- at such great prices!! 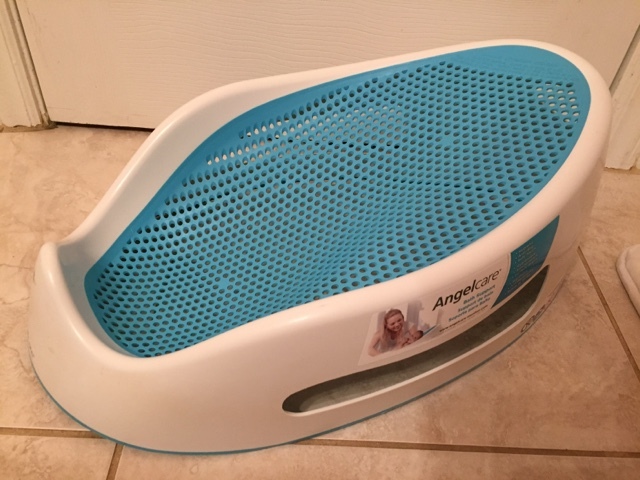 That Angelcare tub is seriously the steal of the century at just $5!! 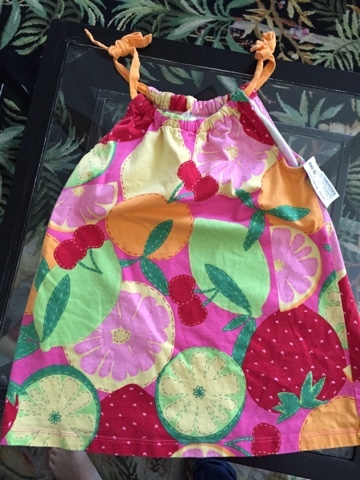 And I am loving the Hanna Andersson fruit dress!! 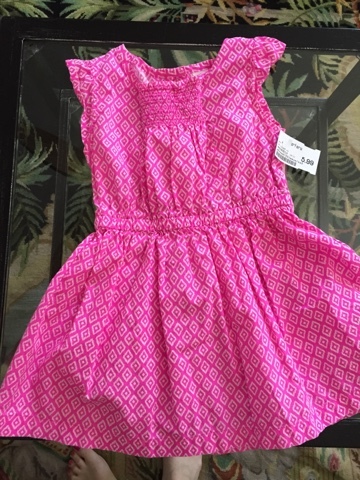 I actually have a lot of great luck shopping at my local Goodwill Store- and have found multiple Hanna Andersson dresses there for my girls!! I also picked up a pair of black Polo brand corduroy pants for James back in December at the same Goodwill when he needed a dressier pair of pants for Christmas Eve Mass- got them for $1!!! I think little girls clothes are the absolute cutest! I have so many matching outfits from when my sister was little and I can't wait to start a family and hopefully have a little girl! I found so many little Lilly Pulitzer dresses a little girl would look adorable in! I am a deal shopper as well! I started shopping for kids clothes at goodwill in the past year. It all started when I would have a little time of kill before picking my daughter up from preschool and Goodwill was right there. Kids clothes are $2 and shoes are $4. Clearance rack kids stuff is $1. I have found brand new stride rite red patent leather Mary Janes, mini Boden, Lilly Pulitzer, gap, and even found a pair of embroidered Christmas pajamas with my daughters name. It's become a little bit of an addiction! I love that HA dress!! Also I saw that lion outfit pop up and almost claimed it but T has SO much. Glad you got it. It's precious! We LOVE Kid to Kid. Last time we were there we got like 12 pairs of jammies! ha! Great finds!!!! The HA citrus jumper and the turtle set are TO CUTE!! Leighton had the poncho when she was around 6 months old but in chambray with white embroidery -- she wore it with little jeggings and it was too adorable! Such cute stuff! Great deals to be had! Girl, I JUST went to the first consignment sale of the season here in my town. And scored 22 items for both Caleb and Vivian...for $78. And that included several smocked dresses from both Rosalina and Petit Ami. I am thrilled. 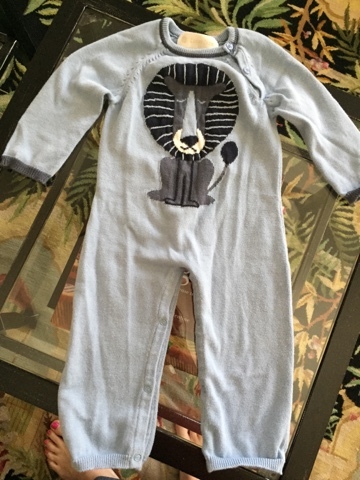 Especially when I can find cute stuff for Caleb, because he is a little wild man and is SO hard on clothing these days! Ain't nobody got time to be paying full price for play clothes that get stained and scuffed during outdoor play! All these pieces are adorable, great finds! I'm with you on the bargain shopping, I love it, especially for little kids clothes. I might just have to hit up a consignment store or two this weekend now. Sully is growing so fast and we're in desperate need of PJs too. 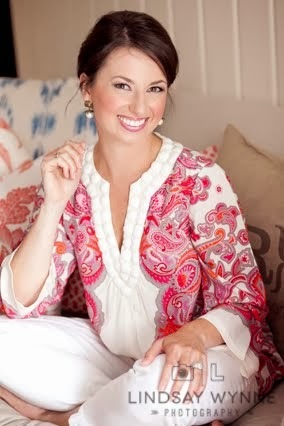 I'm dying over that embroidered Gap top! What great finds! I'm definitely a deal shopper too, and for little kids clothes, I feel it just makes sense! Camille is going to look adorable in everything, and your new baby or nephew is going to look so cute in those pants and sleeper! You found some amazing deals!!! Camille is going to look so adorable in her new outfits and that beach cover-up is adorable as ever! Kid's consignments are the best. Everything is so gently used at this age still! L had that Carter's dress in turquoise last summer, love the pink! And I want that Gap tunic for me!! Nice finds! Girl! What a steal for all of it! That Gap tunic might be the cutest thing I've ever seen. I SO wish that I could find it for my little girl.